1. A warm welcome to Reviews and Musings, a blogger for more than a decade and now a published author. How does it feel? Thank you! Wonderful to be here. Being published feels good. A bit unreal at times, but yeah – good. 2. Was horror as a genre always your forte or it developed with time? No, it was something that happened accidentally. My leanings are more toward the crime & thriller genre. Horror happened by way of a story on the blog and it just caught on. 3. We would like to hear your foray into blogging, then towards writing stories and then ofcourse making the big leap to becoming a Harper Collins Author. Was it a dream which is now a reality? I started blogging on a lark actually, eleven years ago, in May 2003. I’d been reading about how it was cool to maintain a ‘weblog’ (as it was called back then). I think I read about it in an online design magazine. I researched a bit and found quite a lot of folks were actually into it. I browsed some more and found that Blurty had free accounts one could register at, and hopped on. I blogged at Blurty for over two years before shifting to Blogger (Blogspot). I started by writing random stuff really, about life around me, a little bit of my personal life events as well, and slowly shifted to fiction. I wrote my first fictional story on the blog and readers liked it. I continued writing flash fiction. It was great because I had a free-hand, there were no rules, and I discovered I had the ability to create a ‘sketch’ story in under 500 – 1000 words. Plus it was great fun. Readers didn’t have to scroll through lot of text, I received feedback almost instantly, and that fuelled me to write more. I continued writing fiction on Blogger. This was around 2005-2006. It was addictive. So much that I never realized I’d begun to write only fiction on the blog. But hey, people loved it, so no complaints! 4. What role your blog played in this entire journey? A very important role in fact. I credit my writing to my blog entirely. But for it, I don’t think I’d have had the courage to even think about publishing, let alone go ahead and do it. 5. 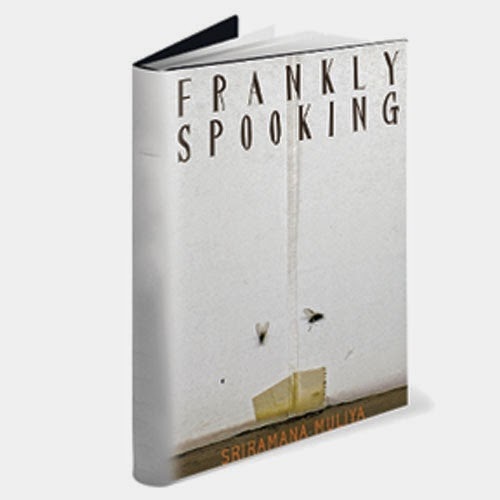 Frankly Spooking – your debut novel with Harper Collins, how did that happen? I researched a fair bit about publishing in India and found that Indian publishers accepted manuscripts directly. Most of them have submission guidelines on their websites. I sent out sample stories to a few publishers including HarperCollins, who eventually got back with a thumbs up. They asked for the entire collection after which they mailed me the publishing offer. The entire process took roughly three months. But since they had a print schedule in place, the book took almost 18 months to actually make it to the bookstands. I was aware of this, though. 6. Your debut book has attracted some rave reviews on flip kart and other sites. It definitely feels very good to read and hear all that I am sure, but we would like to know if there is any particular feedback in general which has stayed with you for some reasons. Yes, there has been just one negative review. And by that I mean, the reviewer has totally trashed the book – called it forgettable, disappointing, unoriginal, bland and several other such adjectives. It stayed with me not because I was upset reading it, but because even in those derogatory comments there was something to learn. I learned that someone somewhere is reading books with a totally unapologetic and ruthless eye, so I have to better myself the next time. Not because I want to turn things around for this particular reviewer, but to exact the maximum out of myself; to be as near perfect as possible so that I set high standards for myself. It is an opportunity. 7. If given a chance is there anything that you would like to change in your book? If yes, what and why? And if no, why? I always am very critical of my own work and it’s never enough for me. I still feel I could change each one of those stories and make them better. In my eye, my work will always be mediocre and there’s scope for more. 8. 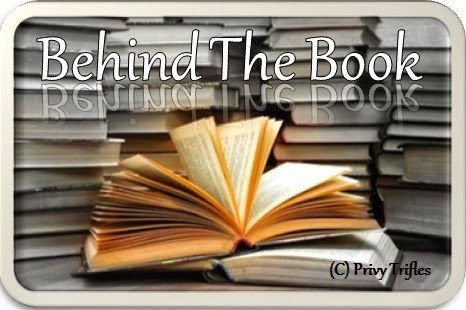 Making your debut book a collection of short stories, instead of a full-fledged novel. We would like to know the story behind it. Sometime last year, after having written more than 80 short stories on the blog, my wife suggested I publish my works, or at least give it a try. To be honest, publishing these stories was never a dream. Publishing a novel was. In fact, I wrote a series on the blog in 2006 which I planned on converting to a full length novel. But life happened in between and that effort never took off. I still have drafts of all those parts I strung together. It might make its way to a publisher’s desk sometime in the future. But coming back to HarperCollins, it wasn’t planned. Around the time my wife egged me to send out the stories, my readers also started suggesting the same thing. Most of them wanted me to publish the stories. So yeah, though publishing a novel was a dream, publishing my stories became a reality finally. 9. What is that one biggest challenge according to you that every writer has to face before being finally called an author or rather a successful author? The biggest challenge is to stop thinking about that word ‘successful’. A writer isn’t successful or unsuccessful. It’s the reader’s perception that makes them so. So a writer should just concentrate on being detached from the entire process and focus on the writing, of telling a moving story. The rest follows. It’s a huge challenge to isolate the dream with reality. But it has to be done. 10. 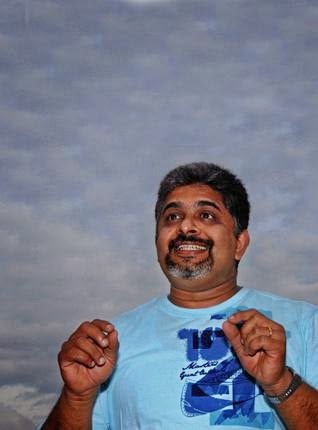 How is Sriramana the author different from the blogger –friend – husband-father-professional that he is in real life? Well, for one, I’m nothing like my stories (Thank God!). I’m very much a normal family guy who returns home to his wife and daughter and takes care of household responsibilities like every other average guy. I’d like to believe I have a good sense of humor and am usually cracking jokes when with friends and family. On the blog and in my book of course, I become a different person in the sense that I create a morbid, gritty world that’s quite unlike my real one. I guess the contrast helps me balance things nicely, keeps me focused. 11. When you talk about horror as a genre you limit yourself to a specific segment of readers for not all enjoy these books. But then the ones who do know what to expect and when. Having said that, do we see you experimenting with genres in your next books or you would still continue with the same? I totally agree. Horror is still seen very skeptically by readers as I discovered in the last one year. I do plan to experiment with other genres, but it’s not because of the cynicism attached to horror. Like I said before, horror is not a passion. A good riveting story is. So I’d like to tell a good story, be it horror, crime, a thriller, or even a good old fashioned romantic one. 12. Any future projects you would like to share with us here about. I’m currently working on a thriller. It’s more of a crime drama with lot of emotional elements in it. Let’s see how it shapes up. Too early to talk more. But it’s not horror. 13. Your thoughts on a writer’s worst enemy – the writer’s block. I personally believe there’s no such thing as a writer’s block. But that said, each person works in a different zone, so in that sense, yes, when one reaches a dead end, one tends to think of it as a block. It can be worked on. One just needs to keep moving forward. From chaos comes order. That’s something I feel strongly about. 14. The Indian Publishing industry is going through a sea change in terms of the opportunities that are available these days for new writers. What are your views on it? Any particular challenges that you might remember from your attempts of getting published. Yes, definitely, there’s a sea change in the publishing industry. Opportunities abound, but it has also made way for a wave of chaos and competition. The advent of Internet and social media has reduced the attention span of people (not all of them though), thus making it difficult for good literature to make a mark. Marketing and promotion have assumed greater importance. It’s all about visibility. Which makes sense in some ways because how else would one know? But this also brings in the danger of a good book getting buried in the milieu and the wrong book making a mark, more because of the numbers it made than out of virtue, simply because it had better visibility. The sheer volume of books coming out into the market makes it that much tougher. But I guess it’s all part of the game and one mustn’t give up. The challenge I faced was similar. You said the book received rave reviews, so by that yardstick it should’ve already become a best-seller, right? But it hasn’t. The reasons are many. But that’s for another day. Since this is my debut work, the fact that I could publish my work in the first place, has given me more satisfaction. And I’d like to keep it at that. 15. What is that one advice you would like to give to all aspiring young writers of today? Just one word of advice. Write. If you don’t feel like writing at any given time, or you feel it’s too much work, then it’s not for you. Thank you very much for your time, it was wonderful having you here and wish you all the best for your future projects.